This page is a work in progress; there may be errors. Contributions are solicited. The fist version of this biography was prodiced in 2005. The 3rd revision (2008) was an update which contained considerable new information from press clippings, a conviction record, his ownership of land and the burial of Moses. "Ordinarily, a common grave would not be available for purchase, but seeing as Moses was the only interment in the grave this can be arranged. The cost of a grave is very expensive especially with the additional supplement for being a non-resident; if you are interested in purchasing the grave it would be £2,686 + £1,479.Alternatively, as the grave is a common grave you could have a 12” x 12” memorial placed on the grave without taking over the ownership of the grave"
This presentation is done in chronological order starting with the birth of a Moses Good in Barnstaple, Devon, England who was baptized at an Independent Church. There are many in the family who believe that our ancestor, Moses Good, was an 'Irish Jew' and who would therefore not believe that this information relates to our ancestor. If they will read, with patience, I think they will agree that the record shown here is our ancestral record and that consequently the 'Irish Jew' designation is a myth. My search for Moses Good started decades ago when I would pester my grandparents (Frank Scott and Elsie Melbourne, who lived in Waskatenau, Alberta, Canada) about my family tree. One of the more interesting people in the tree was a man named Moses Good. The comments that I recorded about 1959, from these conversations, were as follows: "He was an Irish Jew living in Portsmouth. He is reputed to have been successful in the furniture business in that city, perhaps owning several stores. He had at least two sons, one who became a lawyer and the other a doctor in London. His daughter Sarah was "disowned" when she married Thomas Slape, as she was not of his 'class'." Frank's mother was Julia Slape, whose mother was Sarah Good a daughter of Moses Good. My grandparents told me that Moses was an Irish Jew and that Sarah had been 'disowned' because of her marriage to George Slape--perhaps because she married out of the Jewish faith. This story was repeated to me, in its basic elements by Frank's nephew Sydney Ronald (Ron) Scott of Devon, England when I visited him in the '70's and '80's. Ron also indicated that he had a tape of Kitty Scott (the younger sister of Frank) where she expressed the same story. I later obtained a copy of notes left by Moses' great granddaughter, Lillian (Scott) (Fry) Simmons where she wrote: "My Great Grandfather on my Mothers side was Moses Good Jew he owned nearly all Landport Terrace Southsea and lived there in the House with the Golden King over it. He disowned his daughter Sarah on her marriage to George Slape set her up in a furniture business and had nothing more to do with her. One of his sons was a dentist in Southsea and another a Cattle Dealer." (see the copy below in Lillian's hand). These then were the threads of the story that I wanted to trace. On further examination it turned out that two of the records were for the baptism of Moses Good in Barnstaple, England and one for a baptism of a Moses Good in Portsmouth. I obtained copies of the original Barnstaple documents and determined that these were two children baptized by John and Joan Good. It appeared that this meant that the first Moses had died and another son had received the same name; the burial of the first son in 1786 was later confirmed. This left another ten records to trace. Of these ten, the next, chronologically was a marriage in 1808 in Stoke Dameral, Devon. It is interesting to see that Abraham Good is a witness at this wedding. Since Moses, born in Barnstaple, had a brother Abraham (and since both Moses Good and Abraham Good are not common names in the IGI) it provides strong circumstantial evidence that this is indeed the same Moses that was born 20 or so years earlier in Barnstaple. It is to be noted that Stoke Dameral is a parish of the Church of England (Anglican). Can this possibly be our 'Irish Jew'? About this time I became concerned that I was not really accessing the Jewish records in England and so examined the role of Jews in English society at that time. It turned out that England (as did many other Christian countries) had had pogroms to remove Jews from the country. As a result there had been almost no Jewish population in England from the 1600's. In Catholic Ireland, the situation was certainly the same. About the mid-1700's a few Jewish persons started to come back into England. Disraeli, Prime Minister in the early 1800's was of Jewish descent and his parents had come to London with the first of the Jewish immigrants about 1750. These immigrants were largely located in London during the 1700's. It turns out that an Irish Jew born in the 1700's would be almost unique. Encouraged by this understanding I continued the trail of the Christian Moses Good that I had found first in Barnstaple and more recently in Plymouth. Brought from Waterworks Lane Southsea. Hampshire Genealogical Society Deaths Index. This information was provided to me by email and follow up requests for details drew no response; I have not seen the original entry or the source document. However it does seem unlikely that a Moses Good infant buried in Portsea at this time would be other than a child of Moses born 1788. This child would fill in a gap in childbearing and might only have been one of several children who did not survive infancy. Christening records exist for at least seven of the children of Moses and Elizabeth. Facsimiles of these are reproduced below. "Thos. Son of Moses & Elizth Good of the Parish of Portsea; born Nov 10, 1810;baptized Aug 30, 1815"
"Wm. Son of Moses & Elizth Good of the Parish of Portsea; born May 4, 1812;baptized Aug 30, 1815"
"Moses, Son of Moses and Elizabeth Good of this parish of Portsea was born August the 30th and baptized on the 31st of the same month --"
"Frederic, three years old, parents Moses and Elizabeth Good, Daniel St., Occupation Sailmaker"
"Edmund, ten years old, parents Moses and Elizabeth Good, Daniel St., Occupation Sailmaker"
"Emma, six years old, parent Moses and Elizabeth Good, Daniel St., Occupation Sailmaker"
"Sarah, one year old, parents Moses and Elizabeth Good, Daniel St., Occupation Sailmaker"
The next, and last, record for Moses Good in the IGI was the marriage of a Moses Good to an Elizabeth Hicks in 1830 in Plymouth. Could this mean that Elizabeth Brown had died and that Moses had remarried to someone he had known in/from Plymouth -- or was there another Moses Good? I obtained the parish records for the church and found that the marriage was in fact a marriage between a Joseph Good and an Elizabeth Hicks. The information had been contributed by a member of the LDS who had incorrectly copied the details. So our twelve records of a Moses Good, from the IGI has all been accounted for and had all been traced to three individuals, two of whom had died in early childhood. Description & residence of informant Moses Good in Attendance." Bilious Fever is a loose term for illnesses with vomiting, fever and sometimes jaundice. The term bilious fever is purely descriptive. The diseases that could cause these symptoms are legion, in fact practically any disease of the digestive system including the liver could cause vomiting, fever and jaundice. A woman aged 58 dying within 4 days would suggest an infective cause such as hepatitis, cholecystitis or even septicaemia. There is an Elizabeth Good buried18- Tombstone with Vault 101 at Mile End Cemetery. We have family lore indicating that the Goods had a vault there. However the cemetery itself was paved over in the 1960s to make way for a throughway into the center of Portsmouth. The records for the cemetery are available in Portsmouth. but have not yet been researched for our line, as far as I know. It is highly likely that several other members of the Good family are buried in this same vault. In family lore, Moses was said to have married a second time to a wife who was much younger than he. After Elizabeth's death, Moses was living by himself in his residence on Grigg Street in Portsea. He had a large house and probably had servants before and after Elizabeth's death. It was not long before Moses remarried. The ceremony of marriage was solemnized between Moses Good and Priscilla Long at the Register Office in Portsea on 29 January 1849. The certificate is interesting for some light that it places on family information. We see, to start that Moses and Priscilla were both literate, at least to the extent of knowing how to sign their names. We see that they both live on Grigg Street -- it may well be that they were in the same house and had either been living together for some time or that Priscilla had been a servant in the house. We see that she is a widow. We do not get any information on the age of either of them. However, and this is the only place we have seen this information, we learn that Moses Good's father was John Good and that he had been a weaver. This lets us improve our confidence that the Moses Good we are studying is the son of the John Good who had a son Moses in Barnstaple. When Moses married Priscilla he was 61 years old and she was about 26 years, a few years older than Moses' daughter Sarah. It is interesting to see that at this age Moses and Priscilla started a new family for which we have so far identified seven children. These are shown in the following table. We see that at least four of them died in childhood. The fate of the second Priscilla is as yet unknown. The other two Elizabeth Emma and Abraham lived into the twentieth century. We see here that Priscilla was first married to a person of surname "Herbert". In FreeBMD we see that there is a marriage of a Priscilla Long and a John Herbert in the second quarter of 1842 in Dover. It is likely that these entries represent the first marriage of our Priscilla. It should be noted that Abraham's death registration indicates that his mother was "Priscilla Price". This registration by his wife, Mary, is probably in error -- there was much modification of names and dates by Abraham during his life and Mary would not have known nor likely communicated with Priscilla who probably died before Mary met Abraham (see the notes on Abraham for more details on his life). This entry has a lot of interesting information. First we find that Moses who lives at 10 Upper Grigg Street was born in Barnstaple 63 years earlier (i.e. 1788). Note that this is the year of the Christening record that we have. 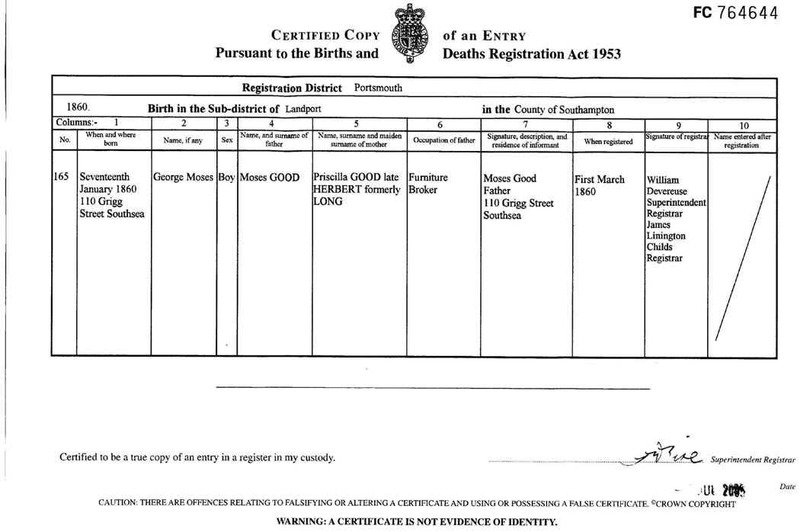 Combined with the marriage registration information above we see that we have certainty that this Moses Good, who we know to be our ancestor, is the one from Barnstaple. We see that Priscilla at 29 is the 'much younger' wife that we had heard of in the family lore. Then we find a surprise. Moses and Priscilla have a 6 months old daughter. She is named Elizabeth and one wonders if this was after Moses' first wife? There are no other children so probably Priscilla had no children by her previous marriage (or they had died). Finally we see that there is a servant from Plymouth, Devon, by the name of Eliza Roberts who is 22 years old. It is interesting that the marriage witness for the wedding of Moses to Elizabeth Brown (see above) some 43 years earlier was William Roberts; there is a reasonable chance this is a daughter or granddaughter of said William. This entry provides some interesting new information. It is the source of the first documentary information we have on two more children to this marriage, Abraham and Priscilla. Priscilla, the wife, on the other hand has done the amazing feat of aging only seven years in the 10 years since the previous census! This leads one to wonder when she was, in fact, born. A search of the IGI reveals the christening on 31 Dec 1823 at the Wesleyan, Monmouth, Monmouth, England. This location, on the border of Wales and England was considered to be South Wales in 1823. The christening record also states that the birth date of Priscilla is 27 Mar 1823 and further that the parents of Priscilla are William Long and Maria. This date of birth corresponds with the birth year of Priscilla as stated in some documents and is within a couple of years of that related to her 'age' as reported in the various census records. We have been unable so far to find an 1871 census entry for Moses and his family. However a Moses Good descendent in Australia contacted me with information that a son of Moses, Mark Good (AKA George Mark Good or Mark Alfred Good) died in Sydney Australia in 1912 at age 56. He was shown as a chemist on his children's birth certificates. He was a son of Moses Good a furniture dealer and Priscilla Price, and had been born in Portsmouth. The 1871 census of England contains an entry for Mark A GOOD 15, born Southsea, is a Chemist's apprentice in Portsmouth in the household of John HARRISON. This is clearly the same person. But how does he tie into the family and what of his mother's name. It would appear that Abraham probably changed his name to Mark at some point (and having done this once changed his name on at least one or two other occasions. Note that the year of birth of Abraham coincides with the year of birth of Mark. The surname of the mother is of interest. Priscilla Long, as she is shown on the marriage record above is the daughter of William Long and a widow; however her married name is not shown. It would appear that it was Price. These statements will eventually be verifiable or refutable. The BMD registers of England which are gradually being put on line do not yet include a marriage for Priscilla Long to someone else; that should happen in the not too distant future. Similarly the birth registrations of Abraham Good do not yet appear, but it should be possible to obtain that without too much difficulty in the near future; I suspect we will never find a birth record for a Mark Good, but that should be possible to determine during the next year or so. In the meantime it would appear the above noted suppositions are likely. We have some information on the life of Moses. From the marriage, christening and census records we can trace some of his early career. He was a cordwainer (a leather worker) in 1808. By 1827 he is styled as a sail maker. In the 1851 census he is a broker. Moses apparently did rather well financially during his lifetime. He came to Portsmouth just as it was starting to expand as a major naval base and just as the agricultural revolution was moving large numbers of people from the farms and villages into cities. Family lore has it that he purchased properties in Landport Terrace. He was active in the furniture business. Beyond the 1851 census we have further documentary indication of Moses life. 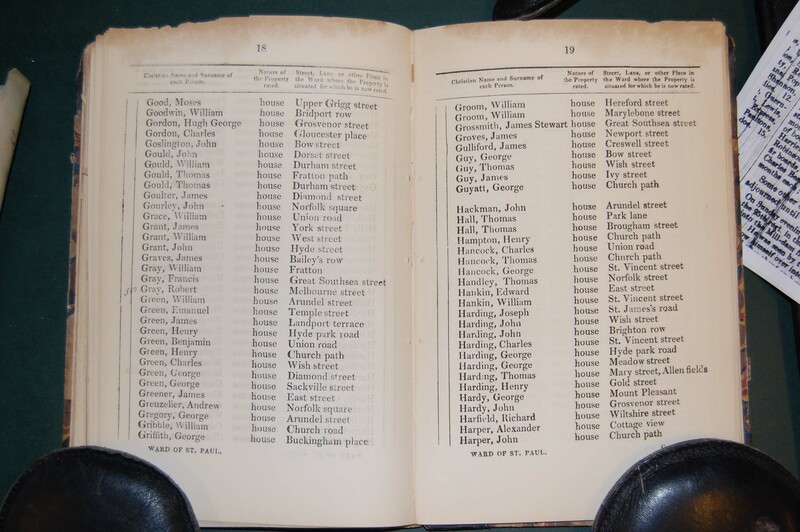 The Kelly's 1859 Directory lists: Moses Good, Furniture Broker, Upper Grigg St, Southsea. Four years later the Simpson's Directory of Portsea lists Moses Good, an upholsterer on Upper Grigg St.. While these do not give us any great amount of new information about Moses they do suggest that he was living in Portsmouth at the age of 75. Upper Grigg St. which backs on Landport Terrace (on the eastern side) became St. Paul's St. in 1881. The area as it looked on a map in 1970 is shown below. In this map Landport Terrace is shown in the center running to the NNW. Kings Road runs just south of east. Paul's St., which was Upper Griggs St. backs on Landport Terrace, to the east. We have at least three different descriptions of where Moses lived in the middle to latter part of the 19th century. The documentary information we have is that Moses lived at Upper Grigg St. from the death certificate of his first wife Elizabeth, the 1851 census and the 1859 Kelly's directory. Great granddaughter Lillian has left the written statement that he "owned nearly all of Landport Terrace and lived there in the house with the Golden King over it". Great granddaughter Kitty said "He had a big house on Kings Terrace". Are these statements in conflict or are they consistent? 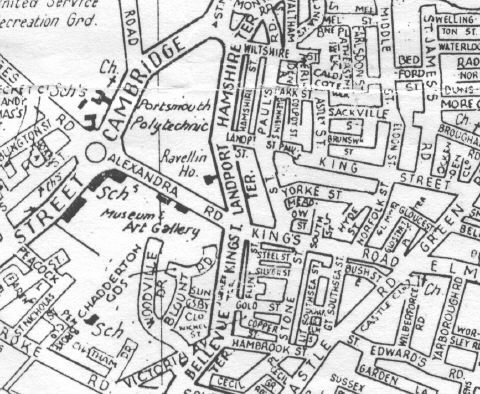 Modern maps of Portsmouth do not show an Upper Grigg St. It was renamed in 1888 to St. Paul's Rd. Landport Terrace is a one block long street running, more or less, south to north. Running off its Southern end, roughly ESE is Kings Rd. A short distance along Kings Rd., running to the north and backing on Landport Terrace, is St. Paul's St. (Upper Grigg Rd.). So we see that likely Moses' home was recalled by his great granddaughters by the more prominent streets at the end and backing on the Street on which Moses lived. Dave Peach who lives in Portsmouth near Landport Terrace has been kind enough to provide a little information on the area. Family visitors will find these comments helpful. "I live in Portsmouth,abt half a mile from Landport Terrace. Kings Terrace was unfortunately mostly destroyed in WW2, it will be of some interest to you that Kings Terrace,along with 4 other Terraces were built in the early 19th century in honour of King George III, interestingly he, I believe, was more commonly known as 'the Golden King' due to his liking of golden statues of himself. There is still one in the Dockyard at Portsmouth.. Odd numbered dwellings in Upper Grigg St(St Paul's Rd) back onto Landport Terrace. If your Moses lived at No 10 it would have been on opposite side of the street. Thought that you stated:No 11. The 3 statements all refer to the same vicinity, he could of course lived in all 3 locations at varying times. No 10/11 would have been about 50 yards from corner of Kings and St Pauls. The area was devastated in W.W.II, it's amazing that Landport Terrace escaped albeit that it would have suffered some damage." 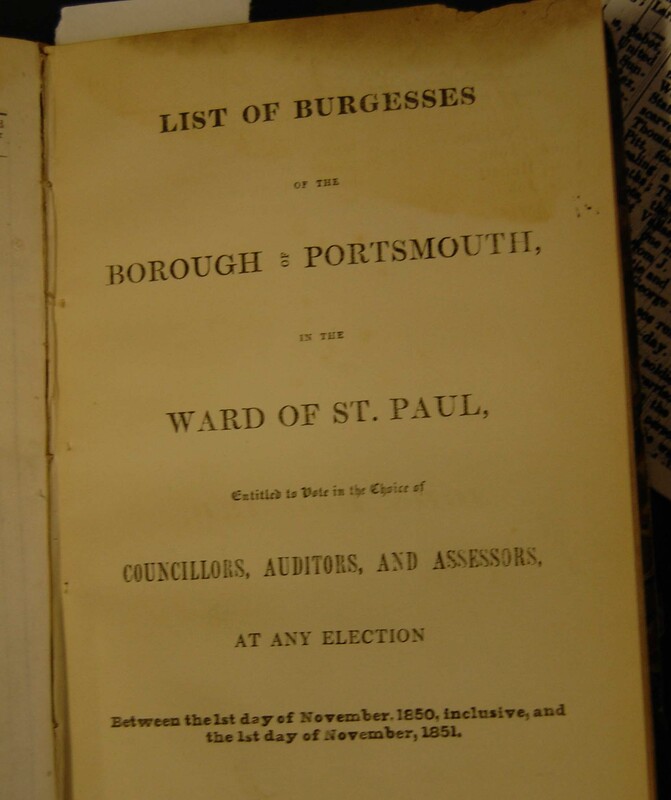 We note that the burgesses were the voters and to be a burgess/voter one had to own property at that time. In the obituary of his grandson, Thomas Good, who died in 1901 there is a hint of Moses' politics. In that obituary it makes the statement that Thomas "was a sound Liberal in politics, belonging to an old Liberal family . . .". This might mean that Moses was also Liberal. It is relevant to consider what this would mean in the mid 1800's. It seems that Moses left a substantial estate and it should be possible to locate his will and learn what happened to it. A descendent of William Good has some wills which relate to children of William and they may hold some clues. 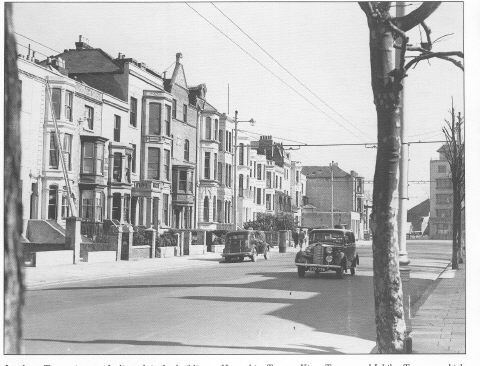 Buildings at Landport Terrace in the 1930's. The house to the left of the tree was destroyed in WW II. 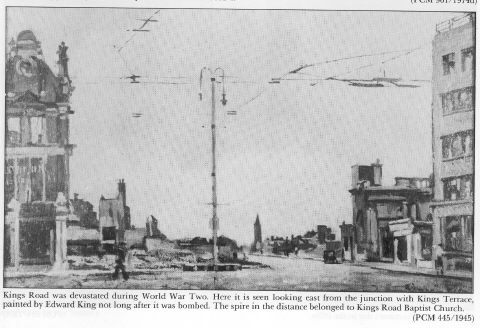 It was at the corner of Landport Terrace and Kings Road. Buildings at Landport Terrace, Portsea about 1999; Moses is reputed to have owned much of Landport Terrace in his time. The similarity to the view at left which is about 60 years earlier is quite remarkable. A painting of the corner of Kings Road and Kings Terrace (to the left is Landport Terrace) The artist was Edward King, The painting is believed held by Portsmouth City Museum No 445/1945. Looking at the area where No10 would have been in Upper Grigg St (St Paul's Rd). This area was probably destroyed at the same time as St Paul's Church, Jan 10 1941 when 300 German bombers dropped 25,000 incendiaries and HE bombs,creating 28 major fires and destroyed 3 main shopping centers one of which was King's Rd,6 churches ,a hospital and many other buildings including the Guildhall.There were 2300 fires,3000 made homeless,171 killed and 430 injured. (copy and comments courtesy of David Peach who lives near here) The 'Tax Shop' in this photo is next to last at the right hand end of the Terrace. The end house is the one destroyed during WW2.Rebuilt as 'The Horseshoe' Public House and now called 'Shoes'. political activity that he was involved in. While I have some thoughts on the relationship of these items to his life, I have not completed the research and so will not comment further at this time -- your input is certainly welcome and I would enjoy discussing these items with anyone who is interested. As indicated in the file containing the press coverage of Moses, he was convicted in January of 1854 of dealing in stolen goods. This led to a sentence of 12 months at hard labour. We presume that this sentence was served but have no details on where. I was able in Portsmouth to actually retrieve the document on which this sentence was recorded in the Quarter Sessions of that time. This vellum document was laid flat and photographed (the rectangular objects in the photograph are lead weights used to hold the vellum flat). Also shown are copies of the newspaper article of the conviction; the photograph of the conviction is high resolution and can be saved to a file for examination under photoshop or some similar program. Any comments would be most welcome. Late in 2004 the FreeBMD (Free Births, Marriage, Deaths list) revealed the death of a Moses Good age 84 in the 4th quarter of 1871. 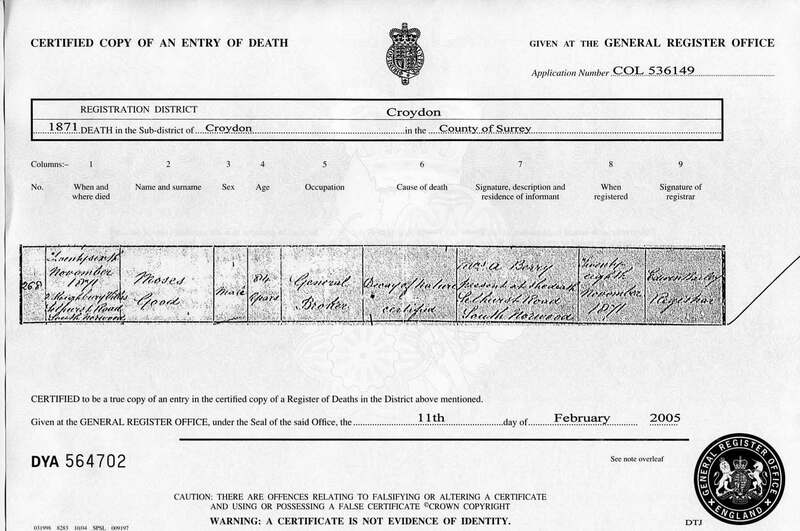 The following image is a copy of the death registration for this death, that of our Moses Good. We have had family lore that Moses had died in London and this death record corroborates that story as Croydon is on the outskirts of London. Another family tale is that Moses lived with or near a son in London during his final years. The oldest daughter Elizabeth Emma Good, by his second marriage to Priscilla, married an Edward Alexander Chaffers who was an assistant paymaster in the Royal Navy at the time of that marriage. 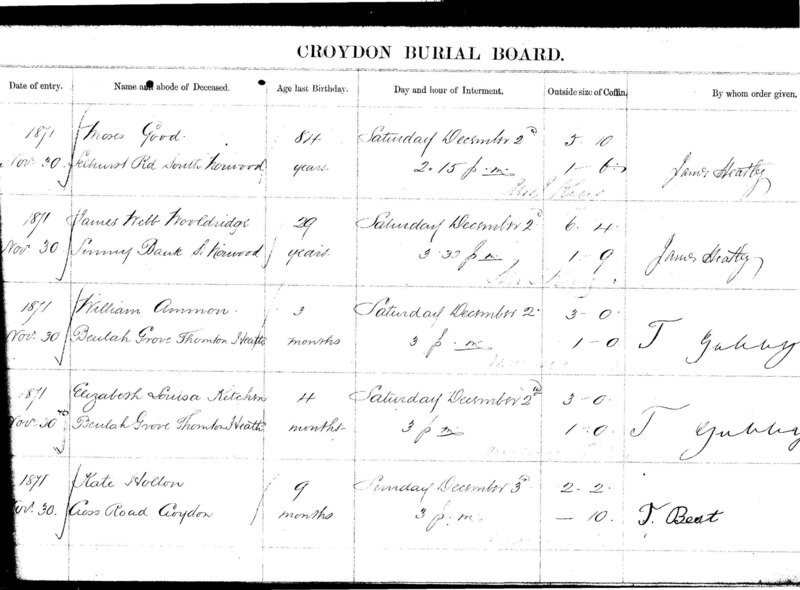 They had three children who died as children (according to the only information we have on this marriage) and one of these children, at least, appears to have died in the Croydon registration district also. It might well have been that Moses and Priscilla moved to London to be near the daughter Elizabeth, another grandchild and so it was to be near/with a son-in-law, rather than a son, the Moses was in London. [These comments are conflicting and confusing -- I do not have access to my original notes and recording at this time and cannot fully clarify them. I leave them here for further correction and provide a version of the story next. It would appear that when Moses died his second wife, Priscilla, shipped his body back to Portsmouth so that he could be buried in the family vault which already had his name engraved in it. A rift had developed between Moses and his first family in Portsmouth (possibly related to the marriage to Priscilla) and they would not accept the body for burial. It was then shipped back to Priscilla who had it buried in a pauper's grave in the Queens Road municipal cemetery in Croydon. (Note that moses died on the 26th of Nov and his body was not taken to the graveyard until the 30th -- this was enough time for it to have been shipped to Portsea and back). The following are items associated with this burial and the grave. On asking I was told that the grave contains only his body. however, it was never purchased by the family and does not have a headstone (which would not be allowed unless the grave were purchased). In essence he was buried in a pauper's grave. Plot map in the sector where Moses is buried showing his grave in red, just above the center of the plot. Record in the cemetery registry of the burial of Moses Good. The size of the coffin (5' 10" long and 1' 6" wide) give some idea of the stature of Moses at his time of death at the age of 84; he might have been 6' in his prime. 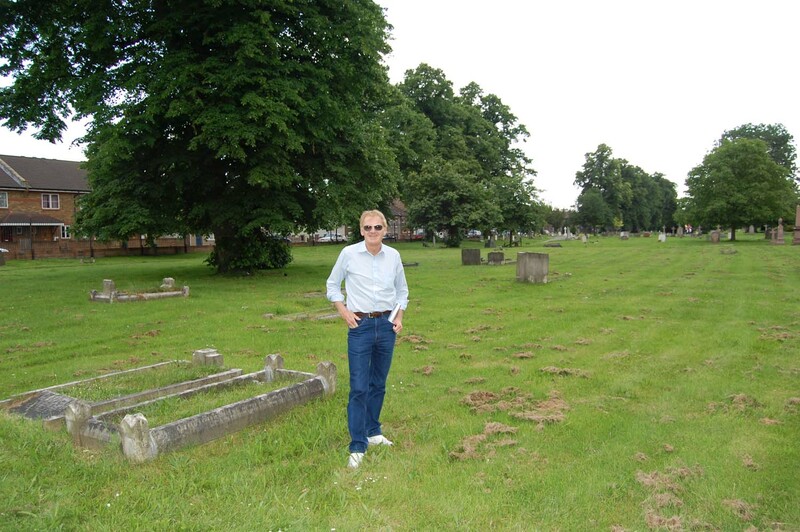 Great great great grandson Kenneth Scott standing on the grave of Moses Good at Queens Road Cemetery, Croydon. The grave is located at 51 deg. 23.393 min N., 0 deg. 5.966 min W. The grave surround immediately behind Kenneth has the number 20038 marked on it. Priscilla was left, then, at the age of about 48, a widow probably living with Moses in South Norwood, but perhaps not. (We would have a better idea if we could find an 1871 census entry for any of the family members besides Mark). What happened to her? The 1881 census contains an entry for: Prescillia GOOD 57 Wid. Head of Young Ladies School. B Wales. The school is at Honor Oak Park, Lewisham, Kent. This appears to be our Priscilla. Lewisham is just a few miles from the South Norwood address where Moses has died. This is the only Priscilla (spelling variations considered) of this age, born in Wales, who appears in the census. 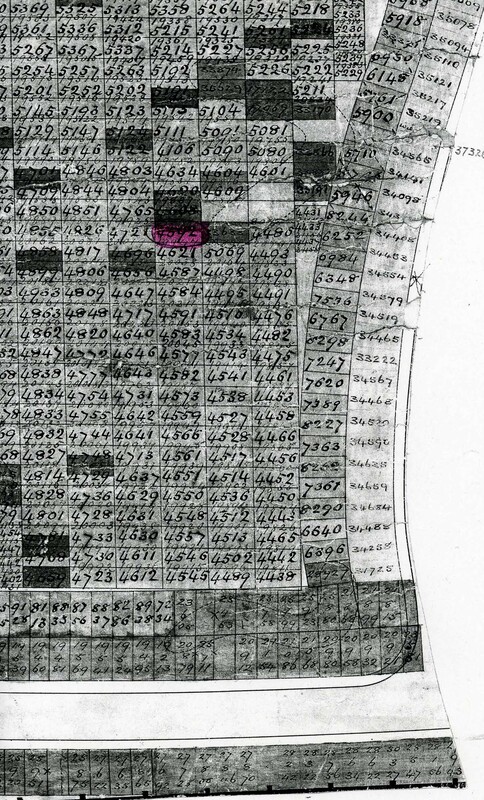 "The Familysearch [i.e. the census on the LDS CDs] information is incorrect. The school was not in Honor Oak Park, but in Honor Oak Road. The order of the entries is irregular in 1881, but I think the school was at Ashbourne Lodge, 82 Honor Oak Road, which is still standing, though greatly altered. Priscilla Good was apparently not there for long. I cannot find her in an 1880 alphabetical directory. In the 1884 directory, which is in street order, I find Miss C.Loresh, ladies' school, Ashbourne Lodge." 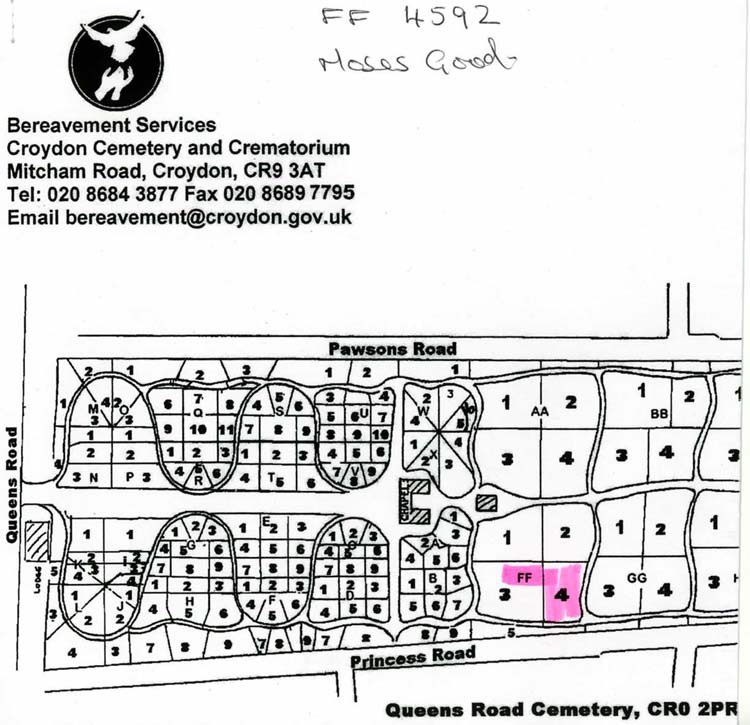 The FreeBMD site has an entry for the death of a Priscilla Good in Q2 1889 at age 66 at Croydon. We have not yet had a chance to retrieve this death registration but it certainly seems to be that of our Priscilla. It may also be that when we locate the burial information for Moses we will find that for Priscilla. The tradition that Moses was an 'Irish Jew' is very strong in the family. It should be clear from the above analysis that We have traced a Moses Good from Barnstaple to Portsea. This Moses Good had a daughter Sarah as well as other children. He married twice, the second time to a much younger woman. He is the only Moses Good that we have found in the census records for Portsea in 1851, a year when 'our' Moses should have been there. Not shown here is evidence that the son Thomas was a dentist and the son William was a cattle dealer. The story of Sarah Good and her marriage to George Thomas Slape confirms the link to our line through Julia Slape and her husband Walter Scott. I conclude then that our Moses was neither Irish, nor a Jew. However it appears that he was very successful with money which may have led to use of the word 'Jew' in its non-religious sense. The reference to being 'Irish' I can only conclude as being an indication that he was from out in that direction -- his Barnstaple birth being far enough from Portsea to be considered as Irish! find information on Moses' 'house with the Golden King' and on Kings Road residence. find further information on Priscilla's involvement at the Honor Oak school. determine if Frederic and Edith Good had any issue; obtain Frederick's death registration; look for Edith in 1851 census. obtain the death registration for Priscilla Good. locate apprenticeship papers for Mark Good. Derek Slape for information on the death of Elizabeth Brown, the 1851 census, as well as information on the Slape line. Doreen (Beer) Scott and her son Andrew Scott for a tape of Kitty (Scott) Barnes recounting some information about Moses Good. Frank Scott and Elsie (Melbourne) Scott for the initial information that I received on Moses Good. David Peach for the 1859 Kelly's listing and information on Landport Terrace and Upper Grigg Street. Philip Griffiths for pointing out a number of transcription errors. Tony & Linda Knight for help with trade listing entries for Moses. Susan Allen (Australia) and Patricia O'Shea (New Zealand) of the HAMPSHIRE list for information on the 1861 and 1871 census entries for Moses and family as well as for other related information and comments. Vicki (Good) Woodcock of Australia whose grandfather Mark Albert Good died in 1912; he was a son of Moses with mother Priscilla Price, for initial information on this line. Diane Purrington and her daughter Vicki, Moses Good descendents living in Portsmouth, England for letter from Olive E. Bridle in 1985, and burial information at Mile End cemetery. This document is 'in progress'. Any errors are mine. Contributions to this account of Moses Good would be much appreciated.